Zamalek continued their relentless pursuit of the Egyptian Premier League title after beating Ittihad 3-1 in Alexandria in an ill-tempered match that witnessed three red cards on Saturday. Ittihad looked capable of repeating their famous win over Zamalek in the Arab Zayed Cup when they took the lead with a delightful strike from Khaled El-Ghandour, only for forgotten striker Omar El-Said to equalise just three minutes later with a glancing header. In-form winger Mahmoud Kahraba put Zamalek in front just before the break after being set up by El-Said, who grasped his chance with both hands after Congolese Kabongo Kasongo, the team's main frontman, joined Saudi Arabia's Al-Wehda on loan. When the referee blew his halftime whistle, a free-for-all erupted, with the official dismissing Ittihad keeper El-Hani Soliman and Zamalek counterpart Mahmoud Gennesh. Ittihad also played the second half with nine men for more than 25 minutes after Mahmoud Rezk was dismissed for a second bookable offence. Set-pieces specialist Mahmoud Alaa converted a penalty deep in stoppage time to ensure Zamalek's win as the White Knights maintained their winning streak. Kahraba and Alaa took their tally to nine goals each to sit on top of the league's scoring charts along with Dakhleya striker Hossam Salama. The Cairo giants top the table with 41 points, restoring their eight-point lead over nearest challengers Pyramids after the latter beat holders Ahly 2-1 on Friday. Ittihad remain 12th on 20 points. Zamalek had a territorial dominance in the opening stages, albeit without threatening Ittihad keeper Soliman. It was the hosts who took the lead against the run of play following a fine move after 29 minutes. A poor clearance by Zamalek Alaa with his chest fell to Nigerian Derick Ogbu "Chuka", who fed striker Khaled Qamar on the left. Qamar then played the ball across the edge of the area, with a superb dummy by Chuka allowing the ball to roll into the path of El-Ghandour to make no mistake with a fine curling effort. Zamalek leveled the score three minutes later, Kahraba's floated free-kick finding the unmarked El-Said who powered a glancing header past Soliman. Kahraba then fired a low shot wide with the goal at his mercy but made amends on the stroke of halftime as Zamalek's pressure paid dividends. He ran onto a superb threaded pass from El-Said to break clear and beat the keeper at his near post. In a slow-paced second half, Zamalek looked content to just keep the ball despite playing with ten men against nine. 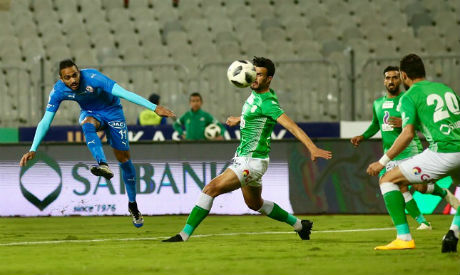 However, they managed to add a third at the death when forward Youssef Ibrahim was tripped as Alaa fired a powerful spot-kick into the top corner.